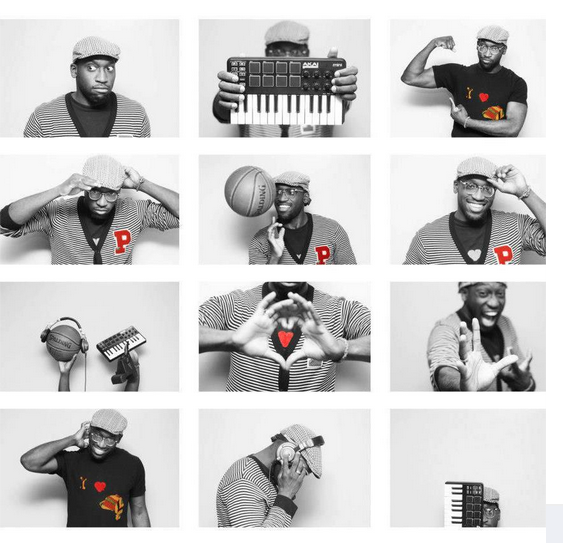 Phinestro is a musician, producer, and composer from Brooklyn, New York. He’s made a name for himself in the music world through placements on the hit show Keeping Up with the Kardashians, advertisements for Aeropostale and Adidas, work with Youtube superstar Bethany Mota, and a PSA on the Spider-Man 2 DVD. In the midst of his rise to the top, WaveDNA talks to him about his process, the importance of personal branding, and what’s in store for the future. How did you decide to become musician/producer? Do you remember the moment you knew it was what you were going to do? How I decided to become musician was at the very young age of 8. I remember playing my brother’s small Yamaha synthesizer through his karaoke amp and just listening to records like Earth, Wind and Fire, Michael Jackson, Anita Baker, Luther Vandross, Gloria Estefan, really good soulful music. In my household growing up, I had more instruments than toys so it was just a matter of time before my curiosity grew from piano, to saxophone, then to guitar. As for producing music, that all started in my junior high school phase with the Sony Playstation game Sony Studio Workstation. It was a straight-ahead production suite, which kind of looked like Fruity Loops, using loops and FX to make music. I’d play that game for hours, not knowing it was sequencing inside music to create a big piece of work. But officially, I started in college. Up until my freshman year, I played guitar on other producers’ tracks for artists’ albums. It wasn’t until after college when I came back home to New York, working for MetroPcs doing video editing, that I would put my own music on the videos I would edit. Using GarageBand at the time, it was basically scoring the videos I was cutting for the clients – it became a hobby, trying something new. It became addictive because of how it made me feel with the intricate processes allowing me to create something based on what I saw. It was fun and still continues to be something I enjoy. From there, I took it to the next level by watching endless Youtube videos and asking a lot of questions. I have a lot of friends who are established music producers and work with major artists. From time to time, I would bond with them in a session, call them up to ask how they do things and meet them to see what process they use to create music of that magnitude. From there, I started researching to understand how to record chopping samples and understanding mixing and mastering. It became very intuitive and easy for me because the tools were similar to video editing tools. I wasn’t concentrating on what kind of music I was creating – it was just about creating something I would like to hear. Here is the first track I ever produced on my own! It’s actually 3 years old but I did manage to update the mix 2 years later. Also, this is actually the first song I ever collaborated on with anyone. The guitar player featured is Pammy Whammy from Michigan. What’s your process for creating music? How do you include Liquid Rhythm in that process? My process of creating music before using Liquid Rhythm was variable. I would start off, my #PhinestroFLIP for example, I would chop up samples into Logic ESX24, then make sure all transitions of the cut were clean, right on grid, and then save samples to play off ESX24 which is basically using a keyboard. I would then drop the drums underneath and stack my drums by drag and drop. The reason why I use that over battery and other sequencers is because I want to have real life swing and also I feel that the drums knock harder when I directly use Wav instead of using a host. That was my problem using some sequencers. I feel my drum samples lost some ump and knock running my drums so I would have to use a distortion or decapitator to compensate for that loss. I have to be honest, I was very sceptical about using another sequencer because I felt it would make my process slow and lose my punch. But now using Liquid Rhythm, it has literally cut my workflow to 1/4th! It has all the beat form sequencing possibilities. At first, to me it looked like Abelton, which was cool. All the producers I know using Abelton, their music sounds amazing. I was like “Okay. Let’s see how easy it is.” So that day I took the leap, and I was so pleased. I did a video on my first process. Liquid Rhythm was so easy to navigate and to just go in. What helped me a lot were the help tips and the COLORS! Yes! I love to color my tracks; it just gives me intuitive hints to what buttons do. I do not feel limited; now I can use MY OWN custom drums and sounds into the arrangement using Liquid Rhythm. I can also import my Akai MPC settings into it! IT CHANGED MY WORLD! Moving forward, when it comes to doing drum productions, I will be using this here on out. I can save my best sequences as favorites, create templates so it’s as easy as drag and drop, finish all possibilities for intro, pre-chorus, hook, bridge, and just bounce out to my DAW to mix and finish. It only took me 5 minutes to figure it out. What I like about the software too is that it also allows you to customize it however you want it on top of the default settings. Customization plays a major role with the ease of use into using it for any DAW without losing the power of drums and creativity. I also tested it on using samples and it was just so easy, even changing my BPM. So technically, I can use this to make click tracks for bands live. You’ve had a lot of commercial success recently. Your music has been featured on Keeping Up With The Kardashians and has been used in advertising for Aeropostale and Adidas. What do you credit your success to? My commercial success was all steam from the social networking and keeping close connections. Not only networking but also creating new content of music and pushing myself to work harder and smarter. I was not doing music full-time; I was doing a lot of work with marketing companies doing promo events and start-ups. The first placement I got was through an amazing musician friend name Dan. We worked events before and he told me he played guitar for a band and had a small studio setup so we linked up. He told me about his friend who is based in Boston doing video production and he said he would send him some links. When Dan shared my Soundcloud link of the song, his friend, Crickie, contacted me on Facebook to work on some music for a fashion client who happened to be Aeropostale. Starting with the relationship I had with Dan, it went from him posting my Soundcloud link on his Facebook to getting attention from Crickie, who took to what I was doing and got me placed directly on Aeropostale, and then Bethany Mota. It was a domino effect starting with that opportunity. The Kardashian show actually happened the same time I got the Adidas placement. This was off a song submission link from ModernBeats.com. I’ve gained so much credit on winning a lot of contests online with the music I submitted to the opportunities. The publisher of iStandardProducer contacted me directly for a lifetime warranty, and another contacted me directly with the Adidas and Kardashian show. It was so overwhelming. I felt it all happen at one time as if everyone was sharing my music or something. Again, it’s all about relationships. Thanks to Dan and Crickie. Also, regarding the placement on Spider-Man 2 DVD, I went to high school with director Luis Servera. We both started our paths at the same time at school. We’ve kept in touch ever since and he pulled me in after he wrote the treatment bringing both Marvel and Sony in to do a PSA about orphans. It just took off as an opportunity to showcase my ability to score music. I wouldn’t have come this far musically if it weren’t for keeping in touch with Luis and our shared passion. I also owe my success to people from outside USA. There is a label/recording engineer company called Audio Animals Label located in the UK which I do a great deal of work with. They did the mixing and mastering on the Spider-Man 2 PSA. Audio Animals not only did my personal catalogues, they also did the winning track from Team USA at the Beat Academy USA vs. Canada Beat Battle at NXNE. Beat Academy opened many doors for me. It was the only beat battle that was very holistic. We met 12 amazing producers and got the chance to do an EDM Round (which is unheard of in any beat battle). It was my chance to show the world what I can do. I got to meet with Young Guru, and have brunch with Symbolyc One and Jake Uno! Never in my life would I have thought I’d be at brunch with Grammy winning producers. Of course, if it weren’t for Beat Academy, Toni, and the crew, I wouldn’t even have met Wave DNA! I’ve never been in a situation that I was exposed to so much greatness in one weekend. Here is the article that Audio animals wrote about it. That leads me to this point in time. I’ve made connections, collaborated with producers and artists, and even won the NYC iStandard Beat Battle Championship. These experiences have all prepared me to expand my horizons. Tell us a little bit about StadiumRed and your work with them. Stadium Red is a recording studio facility located in New York City with engineers and producers who are associated with 12 Grammy winning artists with 22 nominations across multiple genres of music. The studio is also home to engineers and producers like Just Blaze and Omen. They have created a music-publishing brand that is the connection between the artist work and the content placement worldwide. The concept behind the brand is signing the music of artists and producers to a music synchronization license to be used in visual media (such as film, TV shows, advertisements, video games etc.) My role in this is dealing directly with composing music and production for recording artist and songwriter Jeremy Carr. What I love about being in this situation is that I am able to produce any kind of music and send it to them; it’s not limited to one set genre. I love having the freedom to create music and connect it to well-connected people who believe in the sounds I provide. You’re very active and social media and have a big online presence, how important do you think social media is in the industry and how has it helped you? Yes, indeed, I am very active on social media, as much as I am active on production. As a musician, I see myself as a brand. In order to keep continuing to do what I love, it’s important for me to integrate my community, and to share my perspective and the content I create worldwide. One of the series of content which allows me to not only grow in my music abilities but also with marketing presences is what I call #PhinestroFLIP – This is a conceptual movement of using sound from anything to create new music possibilities. It can be from sampling a crying baby and a dog barking and creating an orchestral piece from the samples or using a pianist and a donkey laughing to create a hiphop beat – its all about changing the way people view music. It’s not really about sampling but re-creating a sample and re-engineering it in such a way that it doesn’t sound like a sample but an instrumental piece of a song. Here is an example where I took this phenomenal bass player from Canada name Young Chuck, this old school Christian band and a gummy bear song – put it all together to create this soulful hip hop beat. This is something I constantly do to challenge myself. It really gives me a sense of comic relief and fills many voids especially when it comes to avoiding all possibility of writers block. This was the solution to lead towards my growth along with promoting likeminded people I support. When you show love you get it back. This created a new way for me to interact with amazing people with talent and ideas who make a difference in their community and eventually influence the world outside. What’s your advice for everyone who’s trying to get their music out there and gain a following online? Organize your post. I learned that from Suzanne Paulinski who is an awesome resource consultant for artists looking to be rock stars. She mentioned to me that when you organize your social media ahead of time it gives you some time to create space to breathe. I feel that people don’t know how to do that. Know your sound. Stop copying other artist. Covering. I feel that covering is getting played unless it’s in the context of remixing to pay homage to an artist using new sounds. Stop being in the box. It’s boring. I know this sounds funny, but promote other people that you respect. People don’t understand the power of promoting others. It’s not taking the back seat, because it’s not about competition. There are levels to this. Give shout-outs and reply to things. Only collaborate with people you want to learn from and expand with especially outside of your country. Learn other cultures and how they interact online. For example, I’ve been working heavily with some people in the UK like Paul and Nick from Audio Animals and artist/songwriter Kymberley Myles. Also, in different music genres like dynamo EDM producer Wali Finkbeiner, who is killing the Electro scene in Buenos Aires, and Thiago Gomes from Brazil, is a dope killing accordion player. I just say: seriously consider just going outside your territory! Learn from others who do what you do! Ego aside, you will never break into bigger networks if you do not know how to collectively interact in small networks. It makes a big difference. But at the same time, do not forget your home base. Be selective on who you work with from your own hometown. Get your music with visuals. I work closely with film director/producer Luis Servera and now Ed Cuervo. I’ve known Luis since High School so it was fortunate that we stayed in touch as we sharpened our skills in our own crafts own opened many doors in our own network. Something you should always do is work with people who have a vision on film or design. I also work with photographer Dirty Souf Yankee who actually was there at Beat Academy and who captured the moments of the whole journey. She does amazing work especially live events and moments that really matter the most. Daniel Talonia does a lot of photography in motion dance, modeling, and now film. So combine the whole five senses together to make a beast of a work. Post things that reflect who you are as a person. Garbage in is garbage out. Be conscientious and intentional about what you post and why you post. This reflects your brand and what you stand for. And never give up. Just because someone is your friend doesn’t mean they will support what you do. In the process of getting a lot of places and projects, I’ve lost some friends by way of just continuing my journey. Keep creating and never settle. Always keep asking yourself: “What is something I haven’t done?” then do it! In the meantime, tell people your story. Stay true. That’s a very interesting question because as I had a dream last night that, in the future, I had a major company or some kind of alliance of individuals representing each country around the world and we were all alike in our fields. It was not only music but it was education, science, mentorship, fashion, and multi-media to understand the entertainment business through entrepreneurship. I am Haitian; a lot of people do not know that. Even though I was born in New York, my goal is to really do something great for my country, invest towards change. From the news, you can see Haiti has had a lot of tragic news and has been on the back burner in a lot of political agendas. However, few people know the potential and history behind this gem of a Caribbean island that has influenced the world at large. My future is to have a program serving schools in the island teaching program that has elements of music marketing, creative projects, music production, film, sports, and fashion. These are the things I enjoy and would do more to integrate some kind of exchange program have a student live in Canada or Germany or UK for a week and study the culture through fieldwork. That’s been my passion outside of music because I really enjoy connecting to people from outside USA, to connect and gain that level of excellence for empowerment. I will start in Haiti, and build using my resources here to help build it back up to where it should be. It’s been a goal of mine to give back. Lastly, I do see myself performing my own songs. It’s weird having so much content for other artists, entities in TV and film but one day, sooner or later; I just want to bust out with my own material. Since I am developing my DJ techniques, I would love to implement theatrical dance as well as video and light shows into my concerts. Imagine my PhinestroFLIP live with interaction with a 3-piece band orchestrated! I think that’s where I am heading. Lets see, stay tuned. Where can our readers follow you for music and updates? For all of my updates, you can go to my Facebook page. I also mainly post on my Instagram.